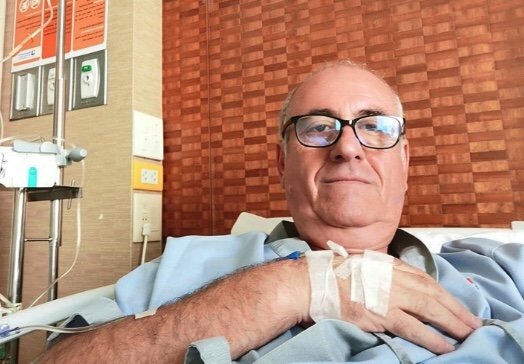 "Get insurance before 60 - I thought I was invincible" says Pattaya's "Kev in Thailand"
A Pattaya expat who is suffering from cancer of the throat has gone on YouTube to warn expats in Thailand to get health insurance. Kevin Burt didn't bother to get medical insurance saying he "thought he was invincible" until he was 60. He is 58 and claims on his "Kev in Thailand" video that he planned to get insurance on his 60th birthday. 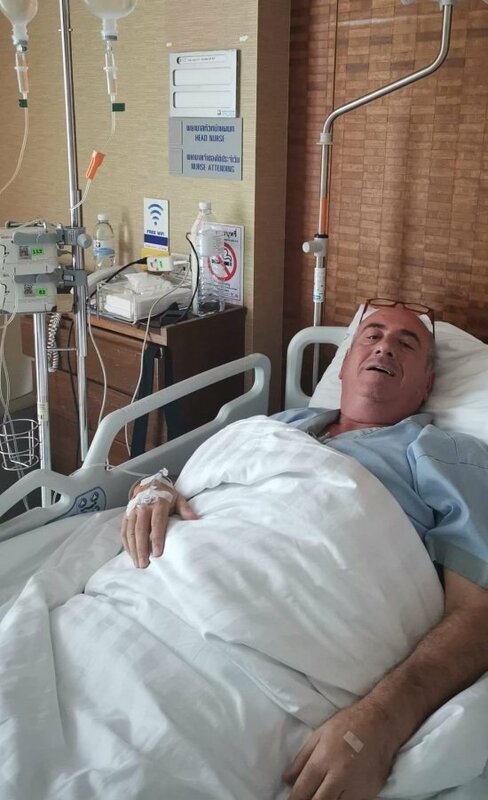 Now another expat has gone on Bangkok Expats to start a Go Fund Me appeal for the stricken Brit. The Brit - from Waltham Abbey on the outskirts of North London and who is known for thick cockney accent - intimates that he is able to pay for his million baht initial treatment but admits that "it will put a bit of a hole in the tank". The video starts with a jingle refrain of "Living a Pattaya Wonderland". It continues with a tour of a Pattaya hospital room when Mr Burt is in for chemotherapy costing 130,000 baht for each of three sessions. He describes his room as both nice and not so nice. He says he is in for "three nights" at a time and also has to go to Bangkok for radiotherapy. "I wanted to start health insurance at 60. I saw no reason to start before. "I worked it all out mathematically", he added saying he was bad at maths. "I thought I was invincible until I was 60. It's not worked out". Mr Burt is upbeat even making jokes about being a biohazard and having a camera in both his ends creating a "spit roast". But he warns other expats, especially those younger than himself to take out insurance. "I don't know how sick I am gonna be". Mr Burt was also concerned by disruption to his popular YouTube channel. Kev, who takes full responsibility for his decision not to have health insurance, said in his vlog: "get insurance, don't be an idiot like Kev in Thailand". Meanwhile, Kev's plight was shared on the popular Bangkok Expats Facebook group. There, Facebook user Ken Jman shared details of a Go Fund Me appeal where people can donate towards Kev's medical bills. "All funds raised will go towards medical bills and recovery with hopes that we if raise enough maybe we can get him a hotel in Bangkok so he won't have to travel daily for the four weeks this coming month", the appeal said. He says he can pay for it but still puts up a gofundme. Just curious why does he not go back for free treatment ? However,in a similar situation I quietly paid up and went home.. Many thanks to my Thai wife and family amd many members of ThaiVisa who supported me as I struggled to get home under my own steam. Many thanks to my home country (Australia) which has looked after me on my return. I am a trifle bemused by all this Go Fund Me stuff.. This guy is a constant beggar. On his site he asks for donations to his channel under the a/c name. buykevabeer. This is almost worse than the kids who come off motos and put out Gofundme pages. This guy knew the healthcare risks but decided against it. I am not as old as he is, but I have insurance. I would be ashamed to have to put my hand out on a go fund me, or other money raising effort. If you live here you absolutely need insurance. If you don't have it, you should be in a position to cover all of your bills. Relying on the generosity of strangers is just wrong. I do accept in this case, someone else started the funding. I think the Go Fund Me page was set up by a friend without Kev's knowledge. kev has said he has the money to pay for his treatment and has taken full responsibility to why he has no insurance. ....Know doubt the haters will be out in force on this thread !!!! I hope the chemo helps him with his accent. think the Go Fund Me page was set up by a friend without Kev's knowledge. Wouldn't wish cancer on my worst enemy. Best he get back to the NHS before he ends up destitute and in Thailand. Treatment ain't cheap. What on earth was his logic in that? Had he enrolled for health insurance before 60, the starting premiums would in all probability have been less than by leaving doing this until afterwards.